ESMO, Munich · 2018, Chajon E. et al. For patients (pts) with hepatocellular carcinoma (HCC) or liver metastasis (liver mets), stereotactic body radiation therapy (SBRT) is a well-tolerated option. Yet, the risk of injury to normal tissues limits the ability to efficiently sterilize tumor cells. Thus, hafnium oxide nanoparticles, NBXTR3, were developed, which increase the interaction of radiotherapy energy dose deposition within tumor cells when activated by an ionizing energy source like SBRT. 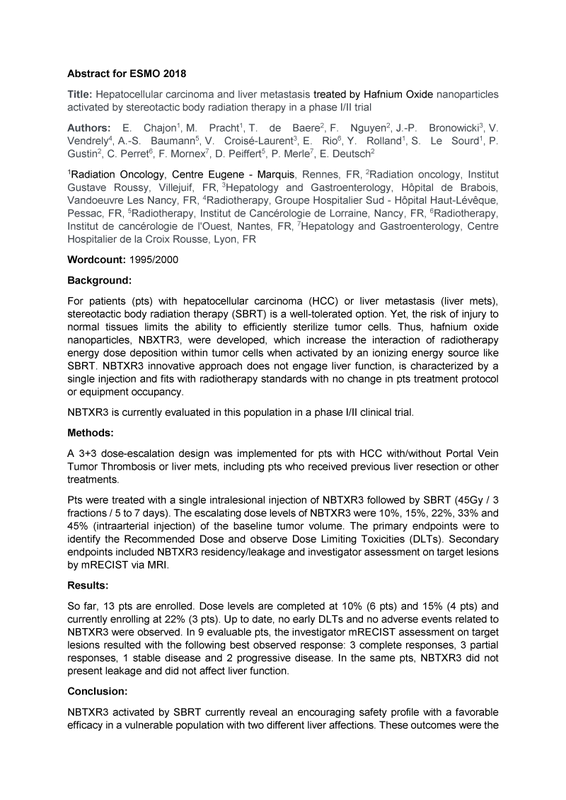 NBTXR3 innovative approach does not engage liver function, is characterized by a single injection and fits with radiotherapy standards with no change in pts treatment protocol or equipment occupancy. NBTXR3 is currently evaluated in this population in a phase I/II clinical trial. So far, 13 pts are enrolled. Dose levels are completed at 10% (6 pts) and 15% (4 pts) and currently enrolling at 22% (3 pts). Up to date, no early DLTs and no adverse events related to NBTXR3 were observed. In 9 evaluable pts, the investigator mRECIST assessment on target lesions resulted with the following best observed response: 3 complete responses, 3 partial responses, 1 stable disease and 2 progressive disease. In the same pts, NBTXR3 did not present leakage and did not affect liver function. NBTXR3 activated by SBRT currently reveal an encouraging safety profile with a favorable efficacy in a vulnerable population with two different liver affections. These outcomes were the result of a complex multidisciplinary cooperation of different medical expertise from different centers.